Benito Mussolini was born in Forli, Italy, in 1883. He later told a journalist: "I come of peasant stock. My father was a blacksmith - he gave me strength. And my mother, she was sweet and sensitive - a school teacher - a lover of poetry - she feared my tempestuous nature, but she loved me - and I loved her." After working briefly as a schoolteacher, Mussolini fled to Switzerland in 1902 in an effort to evade military service. Mussolini returned to Italy in 1904 and over the next ten years worked as a journalist and eventually became editor of Avanti. Mussolini was active in the socialist movement but moved to right in 1914 when the Italian government failed to support the Triple Alliance. 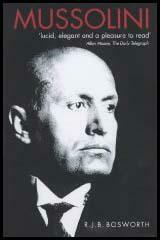 In 1915 Mussolini resigned from the Socialist Party when it advocated support for the Allies in the First World War. After the war Mussolini attacked Vittorio Orlando for failing to achieve Italy's objectives at the Versailles Peace Treaty and helped to organize the various right-wing groups in Italy into the Fascist Party. After a series of riots in 1922 King Victor Emmanuel III appointed Mussolini in an attempt to prevent a communist revolution in Italy. Mussolini headed a coalition of fascists and nationalists. Mussolini was interviewed by the British journalist, Clare Sheridan, soon after he gained power. Sheridan had recently interviewed Lenin, Leon Trotsky, Gregory Zinoviev, Felix Dzerzhinsky, Alexandra Kollontai, Maxim Litvinov, Angelica Balabanov and Clara Zetkin and his first words to Sheridan was "I know all about you and your connections with the Russians". She responded with: "What do you think of their efforts? I want to write about your attitudes to the working classes." Mussolini reponded: "The working classes are studid, dirty, lazy and only need the cinema. They must be taken care of and learn to obey." Realising his mistake Mussolini told Sheridan: ""I forbid you to publish anything I have told you. I have treated you as a friend not as a journalist-I have spoken openly-said too much. If you ever write anything about me I shall know it. I have agents all over the world and you will suffer. There is not a country where my Fascist police cannot penetrate." Parliamentary government continued in Italy until the murder of the socialist leader, Giacomo Matteotti in 1924. Left-wing parties were suppressed and in 1929 Italy became a one-party state. Mussolini also carried out an extensive public-works programme and the fall in unemployment made him a popular figure in Italy. In 1928 John Heartfield created The Face of Fascism, a montage that dealt with the rule of Benito Mussolini which spread all over Europe with tremendous force. 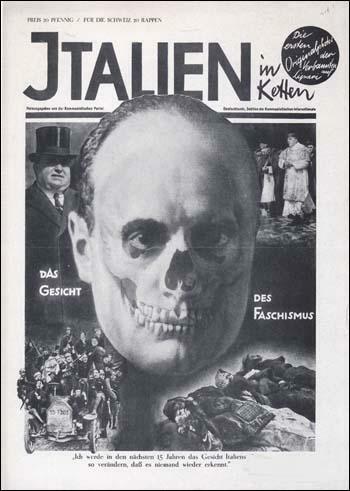 "A skull-like face of Mussolini is eloquently surrounded by his corrupt backers and his dead victims".